(Original Platform) How do I connect a content source? 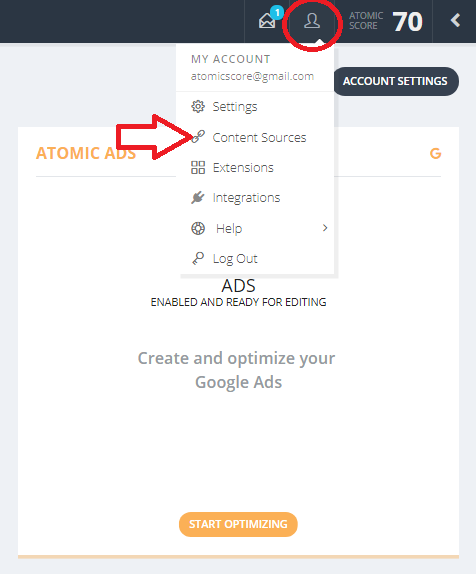 To associate your content with your account, you must connect your content source to the Atomic Reach platform. Connect a content source to an existing account. There are two ways to connect your content. Step 1. Click on the arrow in the upper right hand corner of the screen to bring out the quick view of your account's content sources and social network connections. Step 2. Paste an article / domain URL or an RSS feed into the box below the Add New Source section and click on Add Source. Note: if you are adding an RSS feed, we will only grab what is displayed in your RSS feed. This means if your RSS feed is in summary mode, we will not be able to grab full articles; also if you limit your RSS feed to the latest 10 articles we will not be able to grab anything published prior. Please make sure your RSS feed is set up appropriately. Step 3. Our platform will now scrape your website or RSS feed for similar articles and add it to your account's corpus. This can take anywhere between 5 minutes to a few hours depending on the amount of content but you should start seeing content populating in your account within 10 minutes of connecting. Step 1. Go to Content Sources via the Profile drop-down menu. Step 2. Paste an article / domain URL or an RSS feed into the box below the Add Your Content section and click on Add New Content. Note: if you are adding an RSS feed, we will only grab what is displayed in your RSS feed. This means if your RSS feed is in summary mode, we will not be able to grab full articles; also if you limit your RSS feed to the latest 10 articles we will not be able to grab anything published prior. Please make sure your RSS feed is set up appropriately. If you receive an error message that the content source already exists, it means that our platform already have the content source associated with an existing account. In this case, our support team will reach out to you to resolve this issue. If you do not see your content populating in your account after a few hours, there could be a few different causes. Please reach out to support@atomicreach.com and we'd be happy to help you resolve this issue.